Money is nothing. Money is everything. Money isn't everything. Everything isn't money. Money can preserve nature and landscapes.Money can destroy nature and landscapes. I choose to refuse. Be grateful for the nature that still exists. 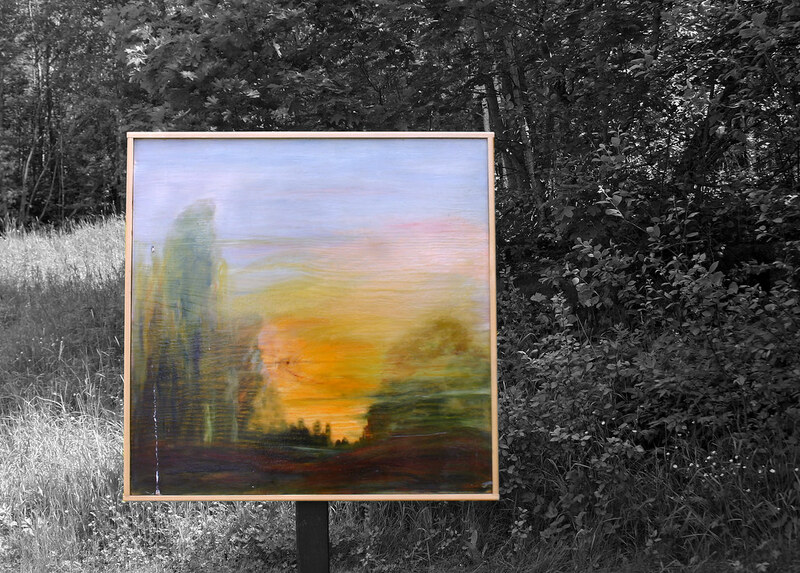 From the 2009 Art Promenade at the gallery in Österhaninge. This is my last photo from this years art promenade. I went back to the gallery over the weekend. I have previously met and photographed Karen, and when I talked to her on Sunday she wanted me to take a photo of one of her paintings in the show room, and mail that photo to her along with a version of the photo you see here which I have now done. Interesting words, and a painting I do like. You are not only a good photographer, but you are also a man of your word. This may be why people are so willing to pose for you. It's very beautiful. Thanks for sharing! If the artist equates money to nothing, is that what she accepts for payment for her pieces? I like that painting. I like paintings on textures like wood. It would have been better flat, without that little frame around it, however. Nice shot with interesting contrasts. Nice painting, good caption and excellent photo. great melding of atr and nature!